Flying the flag for increased passing distances. It is clear that GM Police’s Operation Considerate is not going to change the toxic culture on the roads any time soon; in fact it seems to be going backwards rather than forwards. It is also clear that, whilst the announcement of plans for the Beelines walking and cycling network represents significant progress, it will be some time before we no longer have to share busy roads with dangerous motor vehicles. So what’s to be done? Something we commonly hear from people who either can’t be bothered to think things through properly, or just wish to pursue their own anti-cyclist agenda, is that “cyclists must take some of the responsibility for their own safety”. They usually use this flawed rationale to claim that cyclists who don’t wear helmets or high visibility clothing “deserve everything they get”, or to assert that it is the responsibility of cyclists to make sure that motorists don’t drive into them. I don’t think these people imagine for one moment that cyclists might take their assertion literally. With this in mind, I got to thinking about what I can do in the short term to change the behaviour of those drivers who either can’t be bothered, or wilfully and maliciously don’t want, to leave enough space when passing me in their motor vehicles. One thing that I tried 30 years ago in an attempt to achieve this was to attach a little plastic flag on a stick to the offside of my bicycle. It was useless because the flags and “lollipops” that you can buy are so short that they barely extend beyond the handlebars of the average bike. But what if the flag were wider; could that have an effect and what would be the problems? Now, many people might think it looks a long way out, and it does make a small number of people (or rather some drivers) rather furious (more about that later), but let’s apply some rational thought to this. Drivers are expected to leave a gap of 1.5 metres when passing people on bicycles at 30 miles-per-hour. 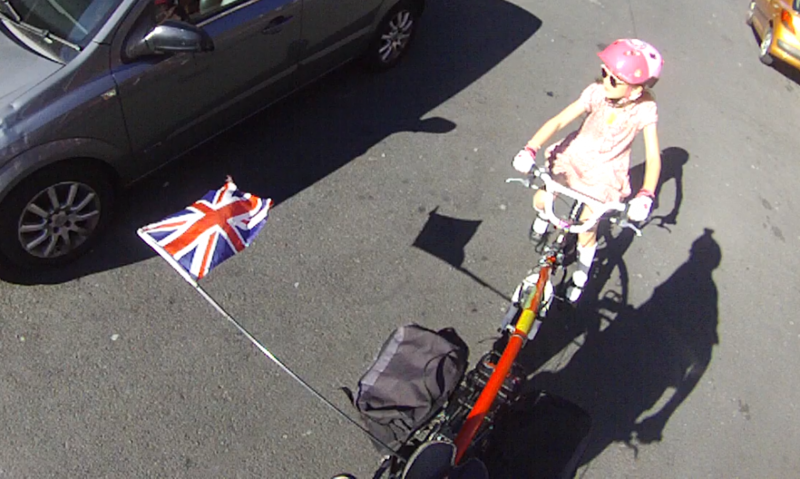 The flag shown here extends exactly 1 metre out from the centre line of the bicycle so, allowing for the fact that my handlebar extends 30 cm out, anyone hitting the flag must be no more than 0.7 metres away from me and my 7 year old granddaughter. This is less than half the gap the drivers are supposed to leave anyway, so it should not be a problem at all. Here is some other information about the flag. The pole is a fibreglass rod that came from a dome tent that we got rid of. The flag is one that was intended for a car to wear during some sporting event years ago, with the bracket cut off, fastened to the pole with a couple of cable ties. 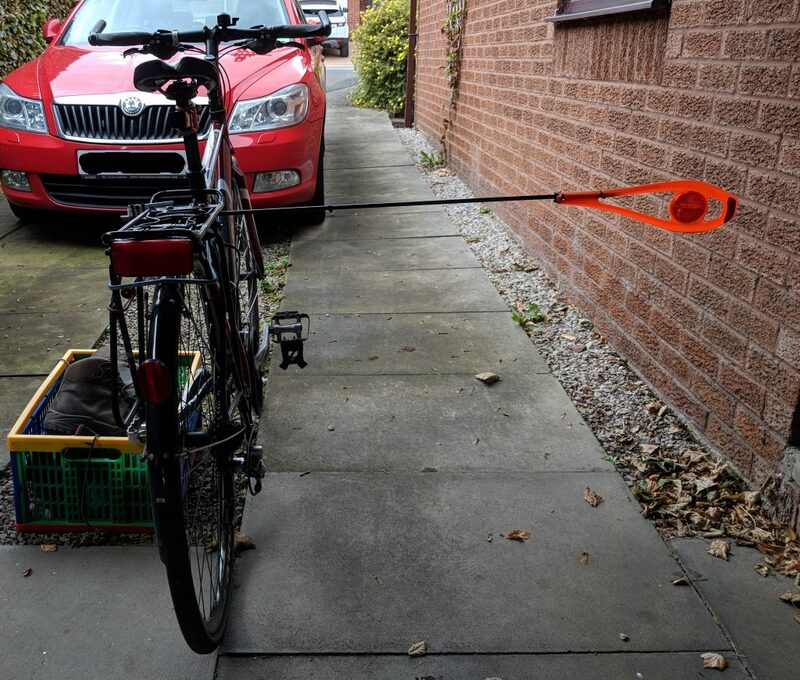 The pole is attached to the bike by means of an elastic bungee cord (left in the picture below), making it easy to attach and detach and allowing it to fold back and forth if it hits, or is hit by, something (right). I have taken my granddaughter to school with this arrangement on three days this week and it works fine. There is one road where drivers too often would try to overtake when we are passing parked cars, and that hasn’t happened since we started using the flag; drivers have been waiting behind until it was safe to pass at a suitable distance. OK, I imagine few people will object to what seems (to the unthinking idiot) like an extreme measure if it’s done to protect a small child from death or injury, but what about that small child’s grandad? 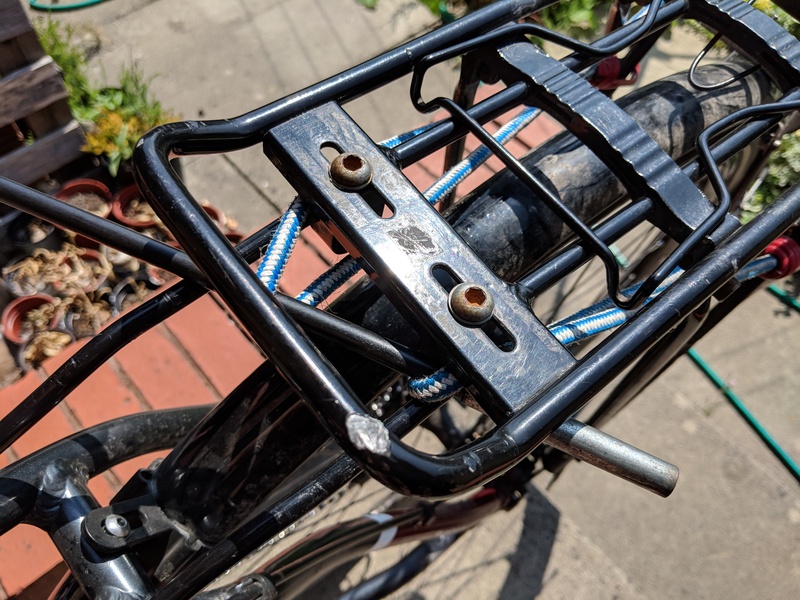 I decided on the second day to experiment with using it even when I didn’t have my granddaughter along, when I’m riding on roads where lots of drivers put my safety in danger on a regular basis. Here is a sample of the results. All of these are uncomfortable to some degree, some are worrying, and the last one was downright dangerous and probably deliberate. Note, by the way, that the Operation Considerate officer didn’t consider that last one there worthy of pursuing, but that’s a different story! I’ve never felt more relaxed on these roads than I’ve felt since I started using this flag; the difference is amazing. Every single driver seems to be passing further away than drivers normally do, and the careful ones are giving me easily the full 1.5 metres of clearance – something that is normally very rare indeed. Even the driver of the yellow bus that passed closer than he should have done gave me more clearance than most bus drivers do at that point. This is another case of very careless and inconsiderate driving that the Operation Considerate officer decided was not worth pursuing. In fact, it was this one that got me thinking again about what I can do myself to change matters if the police aren’t prepared to help. The driver waited patiently behind until I was past the hazard before overtaking nice and wide. Now it may be that this driver would have shown the same consideration even without the flag, but I have not once been cut up at a pinch point since I started using it – something that is otherwise very common. The above two video clips illustrate something else that is different with the flag. One of the tiring and stressful aspects of cycling according to Bikeability principles is the need to move to the primary road position (the centre of the lane or traffic flow) whenever you feel that it is not safe to be overtaken. Pinch points are one example, where you are expected to move out into the middle of the lane at precisely the point where some drivers seem desperate to get past in a pointless attempt to save a couple of seconds. In the second video there, I felt no need to move out from the secondary position (between 0.7 metres and 1 metre from the kerb), so the whole experience is far more relaxed. In general, with the flag, I find I am much more often comfortable to ride in secondary position, or at least more to the left of the lane. Now I’m not sure I will continue to use the cycle lane in the future – we’ll have to see how it goes, but it does seem less stressful now that I have the flag. 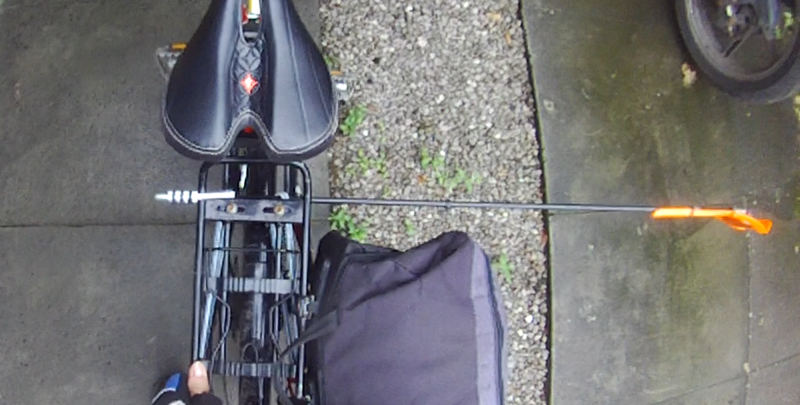 Of course, there are some limitations introduced by having a rod sticking out 70cm from the side of your bicycle. One obvious one is that filtering past traffic queues either on the left or between lanes becomes impossible, and filtering on the right is difficult. 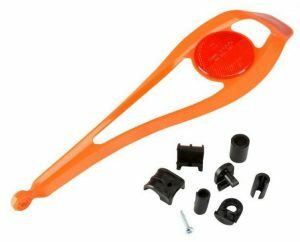 Had I still been commuting a 25 mile round trip to work and back on extremely busy roads in rush hour traffic, that would render the use of such a device impractical. However, nowadays, I find I rarely have a need to filter. 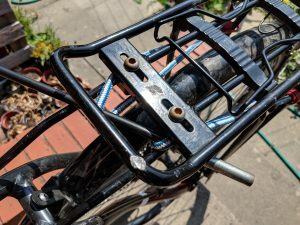 Even if the need arose, it would be a matter of around 30 seconds to stop and detach the flag pole, stowing it along the top bar of the bike. I realise that to some drivers losing 30 seconds of time in getting to the next traffic light seems like the end of the world, but on a bike we tend just to take such things in our stride. As long as the rod doesn’t extend further than the handlebars on the nearside of the bicycle, this should not be a problem, so I can retract it by about 30cm, leaving 40cm sticking out to on the right, which is generally not a problem. 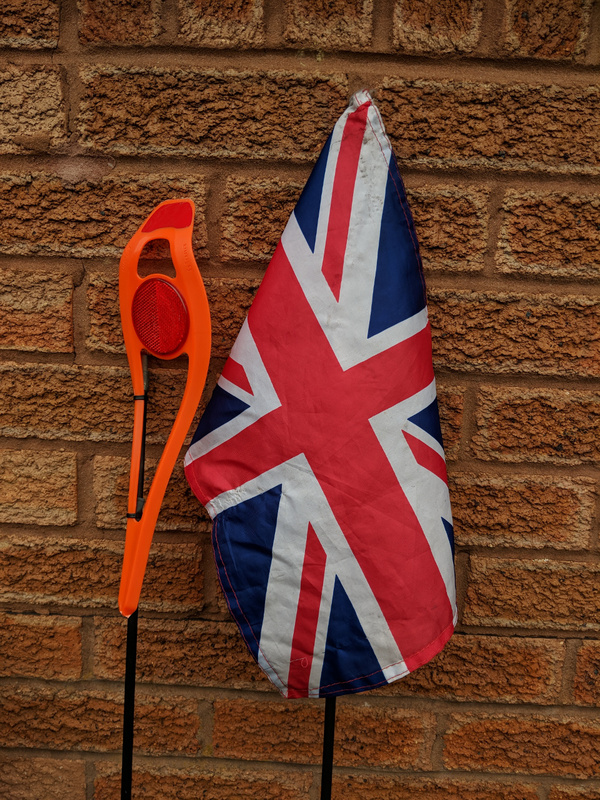 I’m still experimenting with this and may end up shortening the flag by perhaps 10cm, after which the range of extension will be from 60cm down to 30cm when fully retracted. The most awful right turn? This is a problem because there is no road position that you can take up without having a great many drivers wilfully putting you in danger as you wait for oncoming traffic, often with a dose of road rage. This phenomenon is very strange because I have yet to see anyone raging at a car or van driver because they are blocking the lane waiting for oncoming traffic, which happens frequently. There is a detailed explanation of the problems in this Twitter thread. Unfortunately, as you can see from the thread, the officer making decisions at Operation Considerate again does not consider these cases to be worthy of any action. So how does having the flag improve the situation? In this case, I was riding along Ashworth Lane, which is 795 metres long, and I covered the distance in 1 minute and 40 seconds. 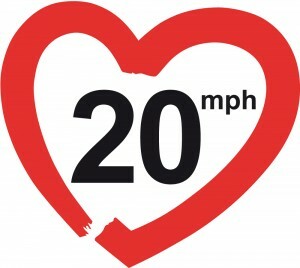 That is an average speed of 18 miles-per-hour on a road with a 20 miles-per-hour speed limit, bearing in mind that there were several places where I was able to proceed but the van driver would have to wait for oncoming traffic. I do wonder how we got into the situation where people of such limited intelligence are able to obtain a licence to drive a motor vehicle in a public space. but, though this one was only about 15 cm away from the flag, he was 85 cm away from me; far too small a distance, but further away than such idiots would normally pass. One effect I have noticed is that this really separates out the reasonably competent drivers from the aggressive raging idiots because, with the flag, far fewer drivers pass close just because of ignorance. Close passes seem pretty much always deliberate when you have a big flag like like this. I’m still experimenting with this and I don’t yet know whether I’ll make it a permanent feature of my riding. However, it does seem very effective, only forces drivers to do what they should be doing anyway and, whilst some people might think it a bit weird, it is a rational solution to a frankly awful situation. What I have decided for certain is that I will always have this flag on the bike whenever I am riding with my granddaughter on the tagalong on the roads. I set myself a goal about 5 years ago in relation to my cycle campaigning, that my granddaughter would be able to ride a bicycle to school by the time she is eight years old. 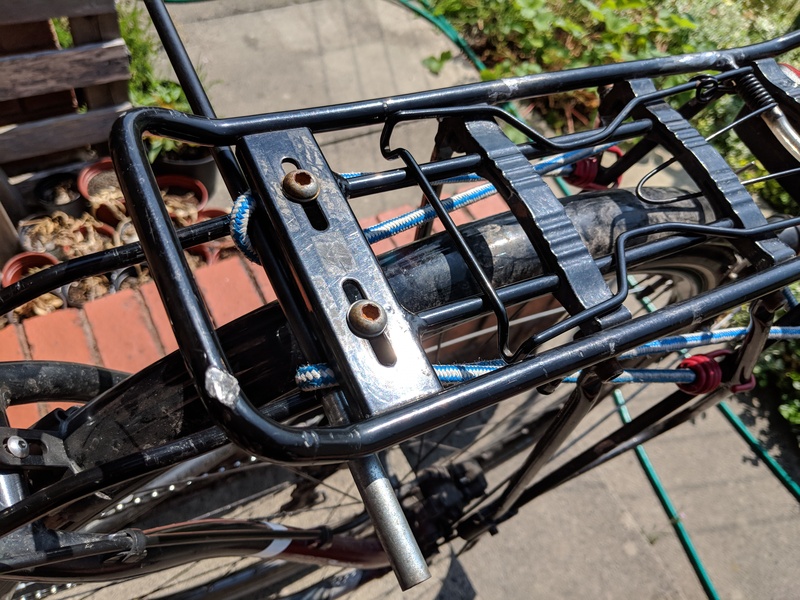 Well, things haven’t quite worked out as I was hoping, though Chris Boardman’s efforts look as though they will bear fruit, but I can claim that I have achieved that goal, albeit in an unorthodox way. 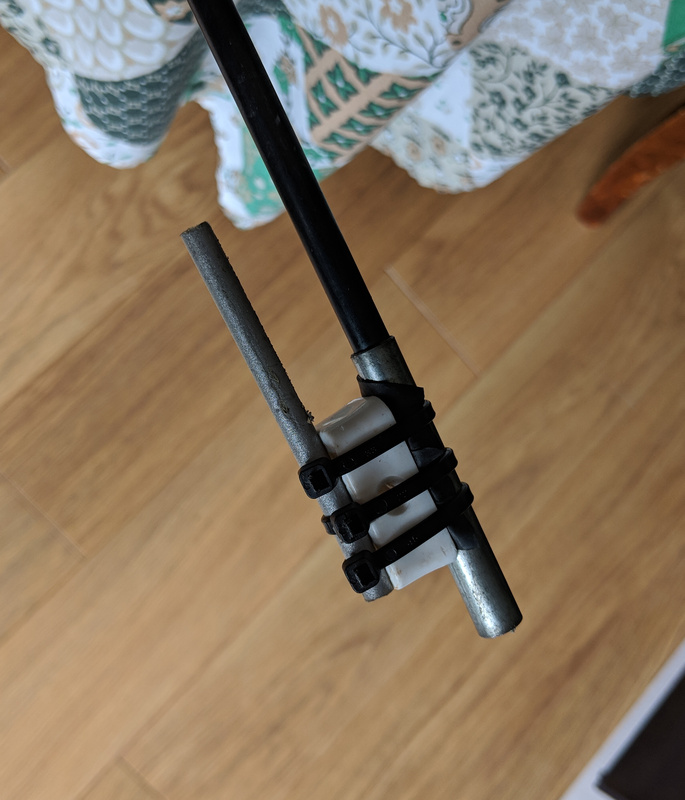 I also added another cable tie with a bit of inner tube under it part-way along the fibreglass rod. This acts as a stop so that when I retract it, it will only move in 30cm so that it doesn’t stick out too far on the left. 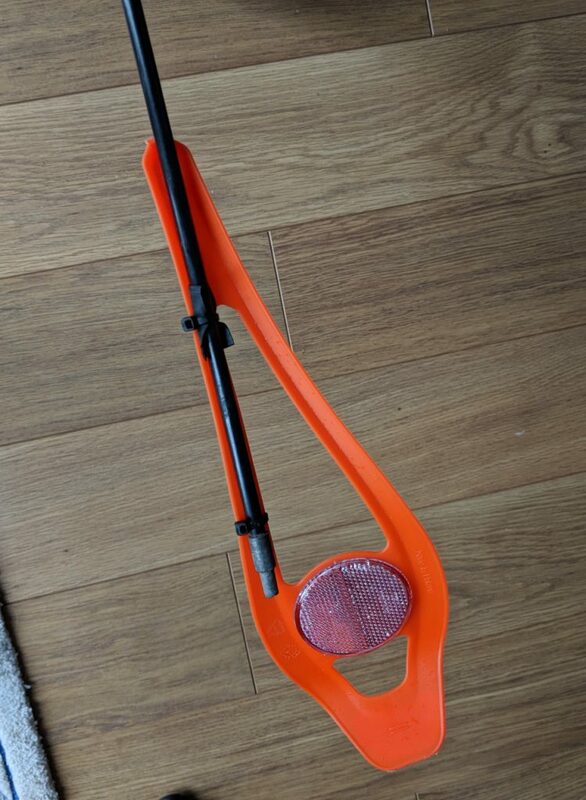 The paddle sticks out only 30cm to the right when it is retracted, so filtering in cycle lanes is not a problem. 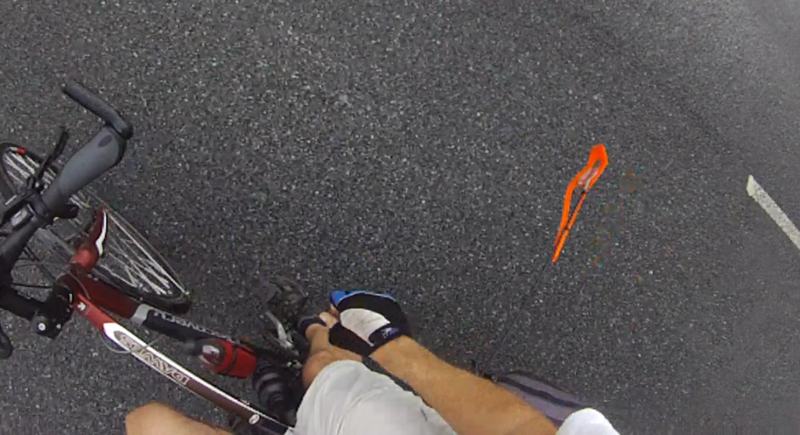 This entry was posted in Article, OpConsiderate, Safe Cycling. Bookmark the permalink. 4 Responses to Flying the flag for increased passing distances. Having had my knuckles scrapped from a guy undertaking me waiting to turn right, you do right, stay in the middle of the lane, own the road, I could have been knocked into the oncoming stream of traffic. good work on the investigation. Yes. 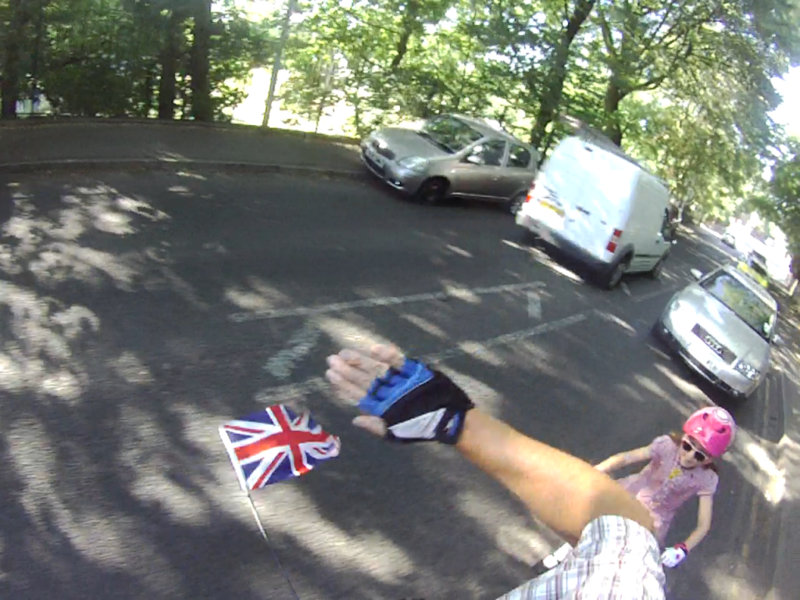 Unfortunately the flag doesn’t help with that so I avoid that right turn altogether now. This is a brilliant site – thank you. I am just beginning, at 49, to ride my bike on the road. Just got an electric bike to help with the hills in Edinburgh. My husband is going to ‘McGuyver’ me this 1m long flag in order to help with safety; cycling in Edinburgh is a nightmare, but I am taking a stand for the environment, for my fitness, for a change to the way folks get around a city. Thanks, and you’re welcome. Let me know how you get on with the flag. Have fun on the e-bike.